I currently have a stock Temperature sensor, on the front engine, driver side, intake manifold location of my 1969 Mustang 302 V8. That sensor works fine, no issues.. I've bought a cluster gauge that has a TEMP gauge, and that unit shows numbers, so that i can see a more accurate reading.. But..is there a SECOND location where I can insert this aftermarket temp gauge sending unit somewhere to get a temperature reading? Like the 289 and 260 cubic inch V8 cars before them the 1969 Mustang 302 V8 temperature sending unit locations, and virtually all of the pre-multi-port fuel injected motors are in the same location, which places the coolant temperature sender insert on the front right hand side of the intake manifold. This also won't change whether or not you are using a stock or aftermarket intake manifold. You haven't mentioned the reason that you want to have both gauges hooked up, so I'm going to have to make some general statements that hopefully will help you. Many of the aftermarket temperature gauge packs come with threading and adapters to fit several applications of the same engine (eg. 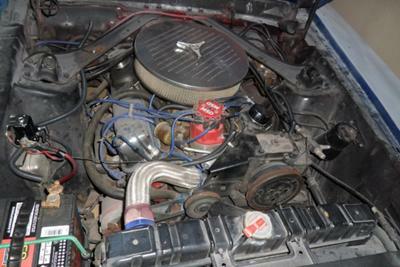 early 1969 Mustang 302 V8 Temperature Sending Unit Locations, 5.0 liter fox body, etc.). In particular, because of the change to metric measurements and the large variety of thread types and pitches, you end up with a one size fits all generic end and usually some adapters. So, if your issue is that the sender does not look like or thread into the stock 1969 intake manifold hole, it can be "persuaded to fit" with an appropriate adapter. If your gauge package doesn't have the right one, you can usually pick up the right adapter from your local parts store. I've seen when changing out an old sender to a new on an original engine, or more likely removing an old aftermarket replacement the sender and insert may not come out as one unit, yet it looks like there was only one piece. With all the old dirt, grease and old paint, it's a good idea to check to make sure that there is not a smaller insert still in the intake manifold before trying to get the new one in. Comments for 1969 Mustang 302 V8 Temperature Sending Unit Locations ? Should the sensor be located in the intake manifold, near the distributor on the passenger side of the engine or in the top of thermostat housing? I would recommend that your temperature sender be installed into the intake fitting instead of the thermostat housing. The difference in the two locations, is that the intake manifold water jacket will show water temperature before the thermostat, while the outlet one, will only show properly after the thermostat opens. This typically means that initially, the water outlet sensor location will show widely different temperatures before the thermostat opens, compared to what happens shortly after.